JSerra senior runner and scholar athlete, Colby Lindholm, was named female Trinity League Athlete of the Year. Coming off of a record setting season Lindholm has become the 1600m champion in 2012 and the 3200m champion for 2013 in track and field for the Trinity League. Lindholm was also a part of the three-time League, CIF, and State Championship cross-country team at JSerra. What Lindholm has accomplished has never before been seen in any CIF sport in Orange County, making her a triple crown three times, in only four short years. Based on Lindholm’s impressive athletic resume she was voted the Trinity League Athlete of the Year by the League and its constituents. “Colby’s long career list of accomplishments at the league, CIF and State levels are a testimony to her grit and outstanding work ethic. 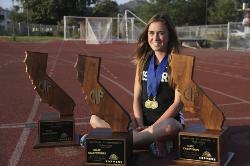 Without a doubt, she is the greatest runner — male or female — that JSerra has ever known,” said Head Coach Marty Dugard. Lindholm will continue her legacy running as a Mustang at Cal Poly San Luis Obispo this fall. Lindholm was invited to attend the Orange County Athletic Directors Association’s “Margaret Davis & Ken Fagans Orange County Athlete of the Year” awards banquet, to be held on Tuesday, May 28 at the Anaheim Convention Center.